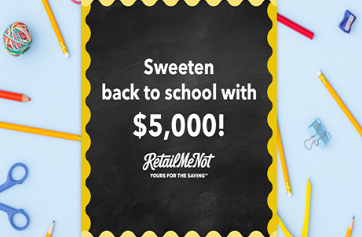 Retailmenot.com Score a Savings 100 Sweepstakes & IWG – Win $5,000! ENTER SWEEPSTAKES HERE – Retailmenot.com Sweepstakes page. SWEEPSTAKES ENTRY PERIOD – The Promotion begins on August 4, 2017 at 12:00 PM (noon) Eastern Time (“ET”) and ends on September 5, 2017 at 11:59:59 PM ET. Sweepstakes Prizes, one (1) per entry period. The ARV of each Sweepstakes Prize is $5,000.